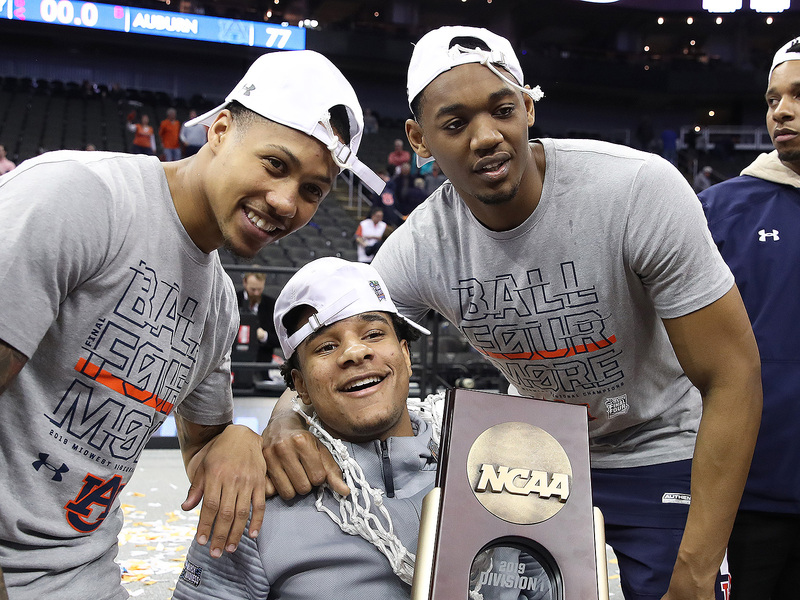 Auburn knocked out three college hoops bluebloods to do something never done in program history, and the Tigers are still dreaming of going further. KANSAS CITY — Theirs was a path to history. Go on, look ahead, their coach said, defying every tired athletic maxim about singular and immediate focus. 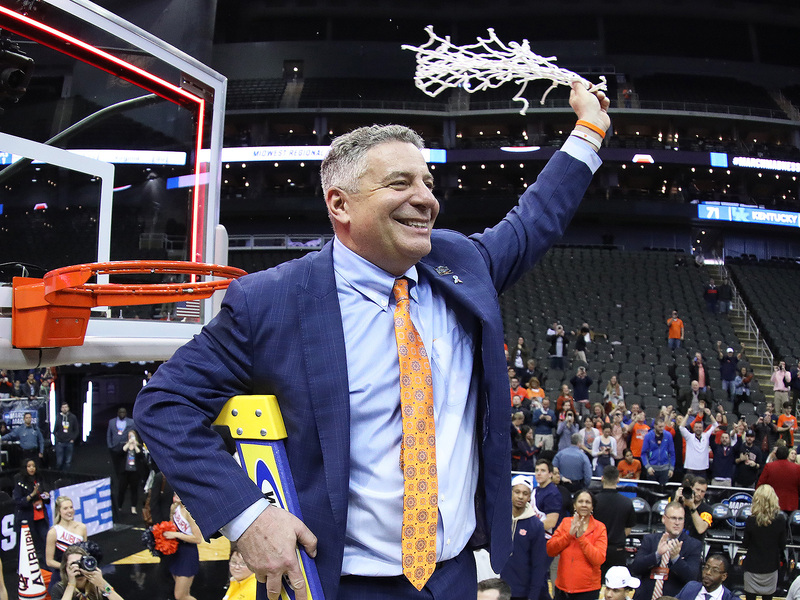 When this year’s NCAA tournament bracket was revealed, Bruce Pearl wanted his Auburn players to see what opportunity lay before them: possible matchups against Kansas, North Carolina and Kentucky. Only the three winningest programs in the history of their sport separated the Tigers from reaching their school’s first Final Four. What could be better? Now Pearl was on the three-point line of a basketball court where both nets had been cut down in celebration, one of which dangled from his right hand. He shared an idle moment with junior forward Anfernee McLemore. “One game away from playing for a national championship,” Pearl said. “Unbelievable.” McLemore grinned and looked somewhere faraway. Tournament play has a way of forming, accelerating and making seemingly unstoppable a team’s momentum. Auburn now enters the Final Four as the country’s hottest team, winners of 12 straight games including eight in the last 18 days, spanning the SEC tournament and now the NCAAs. They have done so because what courses through their veins is not blue but something like ice, compelling them to attempt a shade under half of their shots from behind the three-point line (a greater share than any national champion to date) and enabling them, when as on Sunday they do not fall at a high rate, to trust their undersized guards to boldly and daringly score through other means. It was Harper, who was named the Midwest Regional’s Most Outstanding Player, who could seemingly take on the world during this game’s final few minutes. He scored the opening two baskets of overtime, both on cunning drives to the hoop where he got past one defender and got off a layup before another could close in—a tone-setting four points that marked only the beginning of the 12 he would score in that five-minute period. In the first of Auburn’s three games against Kentucky this year, a two-point home loss in January preceding the blowout a month later, Harper had missed a potential game-winning layup in the final seconds. The Tigers had expected—rightly, it turned out—that the teams’ third meeting would play out along a similarly competitive margin, rather than like the catastrophe of the second, a task made more difficult by Friday’s season-ending injury to sophomore Chuma Okeke, a versatile 6’ 8” forward who had been the best player in the Tigers’ win over North Carolina. Without him, Auburn had few answers for Kentucky’s own 6’ 8” hobbled future pro, PJ Washington, who scored 15 points in 14 first-half minutes while playing through the pain of a recently sprained left foot. The break also brought good news. Bruce Pearl got word that Okeke, who had at first opted not to attend the game due to the pain in his leg, would arrive for the game’s second half. When he told his players, a thrill shot through the locker room; Brown, who had been Okeke’s roommate in the hotel this trip, said that until today even he had not seen Okeke since after Friday’s game. Brown was the first to greet him when he emerged from the tunnel by Auburn’s bench during a timeout in the second half. Okeke, being pushed in a wheelchair, was clad in a gray sweatsuit with his left leg propped up in front of him and secured from thigh to ankle in a heavy black brace, and the sight of him launched much of the arena into a chant of “Chu-ma! Chu-ma!” Later he reprised Friday’s postgame role of applying the AUBURN decal to the oversized NCAA bracket commemorating the team’s advancement. The game stayed tight into the final minute of regulation until Harper, the would-be hero of the teams’ January nailbiter, redeemed himself this time, driving and scoring for the tying layup with 36 seconds left. On the other end Auburn managed to stop Washington in a crucial moment, as senior Horace Spencer—normally a reserve, who started the game in Okeke’s place—swatted Washington’s shot at the basket. A second try by Kentucky’s Keldon Johnson also missed, which Brown corralled with 10 seconds left to initiate a break the other way. He found Spencer—just a 3-of-18 three-point shooter on the season—on the wing for a buzzer-beating try that found only iron. “I thought he was going to pass it back,” Brown said in defense. With that he keyed a win that marks one of recent years’ most impressive builds. Fresh off a three-year show-cause penalty for NCAA violations at Tennessee, Pearl came to Auburn in 2014 aiming to revive a middling and long-irrelevant program that had gone a decade without an NCAA tournament appearance and was an afterthought, at best, compared to the school’s storied football team. He promised recruits that they would be “the building blocks for something great,” in McLemore’s words, and last year lead them to this tournament’s second round. This season began with a top-15 national ranking, then drifted off track with a 7–7 midseason lull, culminating in their whooping at Kentucky in February. Avenging that loss while propelling themselves to the Final Four, and the precipice of a possible national title, was for some Tigers hard to process. He too had helped seal the win, blocking a mid-range attempt from Johnson with Auburn up four and 10 seconds remaining in overtime. Harper collided with Johnson in pursuit of the loose ball, drawing the foul while taking a hard spill onto his tailbone that left him laying momentarily on his back to collect himself. McLemore bent down and began lightheartedly compressing Harper’s chest with his hands. “A little bit of CPR just so he could wake up and knock the free throws down,” McLemore explained later. He hit both, launching a thousand rolls of TP onto Toomer’s Corner and drawing tears of joy from alumnus Charles Barkley. The game officially ended with the ball bouncing toward Harper after one final, futile miss from Washington. The point guard broke down the floor in celebration, tossing the ball high into the air. It was a fitting conclusion given that for all the Tigers’ defiant believing, Harper’s might have been the earliest and strongest. Over the weekend several Auburn players said even when they bought into Pearl’s vision luring them to campus, they imagined a winning team, a proud program, but not necessarily this. Harper said his recruitment had sparked in his imagination a future 30 for 30 documentary, chronicling the Tigers’ rise to national powers. On the court after Sunday’s win, Harper said, “A lot of us came here to be able to make this history that we’re making right now.” It was some story, all according to his coach’s script.